Picture this, you wake up and pull open your blinds to see a tropical island framed by towering palms and sugary sands. You have some very important decisions to make today: Should you snorkel in the Indian Ocean amongst the rays and turtles, or cool-off with a dip in the picture-perfect infinity pool? This is not a sun-drenched dream, it’s a typical day-in-the-life for holidaymakers on one of the many Maldives islands. Affordable and cheap aren’t two words that are typically associated with Maldives resorts. After all, this holiday hotspot is known as being home to some of the most luxurious resorts in the world (checkout the photos of the Grand Residence Villa at the One and Only Reethi Rah). However, with a little savvy know-how, you can do some research and find incredible Maldives holiday packages. Read on for our top tips that will help you to scout out the best deals around in no time. Why Book a Package Holiday to the Maldives? There are several main reasons why you should book a package holiday instead of booking flights and accommodation separately. One of the main reasons is time. By going down this route you can book your Maldives hotel, accommodation and even transfers in just a few clicks of a button. This alone can save you hours of searching for Maldives flights and trying to tie them in with your ideal resort booking, and then book those transfers too. Another reason is cost, as these package deals will often save you a lot of cash compared to when you book things separately yourself. On the downside, not all Maldives resorts are available as part of package deals, and you may not be able to reserve your favorite room type, so it helps to be a little more open and flexible with what you are looking for. Overall, package deals are a great way to save yourself some time, hassle, and money when booking your trip. 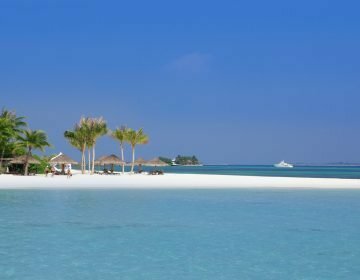 Before you start to scout for those Maldives Packages, it’s a good idea to know about the different seasons and when is the best time to visit the Maldives. for those cut-price deals. There are two main seasons in the Maldives: A high season which runs from December to May and a low or off-peak season which runs from May to November. The high season has the best weather with sunshine-filled days and minimal cloud cover, but they it also brings with it the highest prices, particularly around Christmas, New Year, and Easter. If you’re looking for the best prices on Maldives holiday packages and incredible Maldives hotels, then plan your trip so that it is in one of the off-peak months. Be prepared for rainy days and more overcast weather, however, downpours will often shift quickly and sea temperatures are still bath-water warm. The Internet is your best friend when it comes to finding those deals, particularly on comparison websites. These allow you search for packages on chosen dates. If you can have flexibility with when you leave you are more likely to land those extra special deals. More and more airlines have started to offer holiday packages which include their flights and accommodation. You can first use Skyscanner to see what airlines operate from your chosen departure Airport. 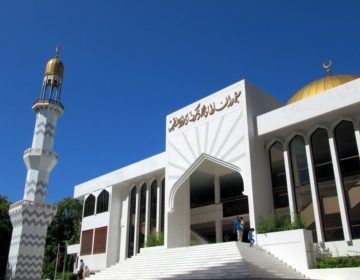 You will be flying into Male International Airport which is located on the island of Hulhule. This airport is served by a large number of top airlines including Emirates, Etihad and Singapore Airlines. Once you’ve found your airline of choice, head over to their website and see if they offer tailored holidays or package deals for your trip. It’s rarer for resorts to offer these package deals on their website, but in some instances they will, so it’s worth having a quick look at their websites to check. If you need to stay on the island of Hulhule for a night, then we recommend the Hulhule Island Hotel – Click here to see more photos and to book your stay. If you are heading to the Maldives on your honeymoon, then have a search for honeymoon package deals. 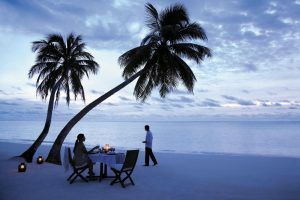 You can also check out this article that reveals everything you need to know about a Maldives Honeymoon. These special honeymoon packages will often include a number of free bonuses, such as excursions, romantic dinners, couples massages, and even sweet touches like a bottle of champagne and rose petal-covered bed for when you arrive. 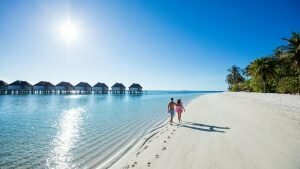 Even if you don’t end up booking a honeymoon package, then you should still email the Maldives resort in advance to let them know that you are celebrating your honeymoon there. More often than not, they will throw in some free extras and surprises for you. Every package holiday comes with different terms and conditions, so it’s a wise idea to ask a few questions before you book. You’ll want to know what kind of package is offered: Is it the Maldives resort all-inclusive, half-board or room-only? If it is an all-inclusive package, find out exactly what is included. For example, on some resorts that means absolutely everything is free, while on others you may be limited to local spirits or only dining at certain restaurants. Read this article for everything that you need to know about Maldives all-inclusive holidays. What room type will you get is another question that you need to ask. Sometimes, the cheaper holiday packages will put you in the most basic of rooms. If you have your heart set on an overwater villa, then you may want to contact the resort and ask if a package upgrade is possible. A top tip is to head over to Tripadvisor and read reviews from past guests. With a little detective work, you can find out what the best villas at the Maldives resort is, and then try and nab it for yourself. You will also need to find out if transfers are included in your Maldives holiday package. Because of the secluded island nature of the Maldives, the most common way to get from the airport to your resort is by seaplane. Quite often, these are not actually included in the Maldives holiday package price. Make sure you check the costs of your seaplane transfer before you book, as they can be pretty pricey indeed. It’s worth noting that seaplanes often do not depart after dark, so you will want to try and pick a package holiday which has decent flight arrival times. If this is not possible, then there are several four-star hotels located near to the airport where you can stay for the night and then hop on your seaplane in the morning. Some of the closer resorts can be reached by boat, again check if this is the case before you make a booking. This is a toughie and a question that many people have divided opinions on. You can choose to book super-early and bag yourselves those early bird deals, or leave it right up until a week or month before to book a Maldives hotel in the hopes that you will find a last minute deal. The truth is, both can be successful ways of lading cheap Maldives holiday packages. The type that you choose to go for should depend on your personal travel style. If the thought of booking a trip at the last-minute fills you with anxiety, then go for the early booking option. If you’re more chilled, and actually find it quite exciting to book your trip so late on in the day, then opt for the last-minute option. Once you’ve found an incredible deal, you can shave even more off of your booking by using these simple trips. One of the best ways to do this is to use a cashback site. When you purchase anything online through an advertisement, the advertiser will be paid a small percentage of your sale. Cashback sites work by paying that commission directly back to you rather than the advertiser. They are simple and easy to use, and you can expect to save anywhere between 1% and 5% percent off your package holiday. This can actually work out to be quite a lot, particularly if you are traveling with the whole family. You can also choose to book your accommodation and flights separately. Depending on the time of year that you visit, this option may actually work out better for you. It’s just worth noting that it will take a little extra detective work in order to find those great Maldives deals. If you’re flexible with your departure times, or happy booking things at the very last minute, then this option may actually prove to be cheaper. You can use Skyscanner to see what flights to the Maldives are available over a whole week, month, or even year. This is a great way to score the cheapest Maldives flights around. Try also looking for connecting flights that stop off in other countries. Air Asia X have just launched incredibly low flights that depart from Kuala Lumpur , so if it fits with your departure destination then you can even turn your vacation into a cultural multi-stop trip. 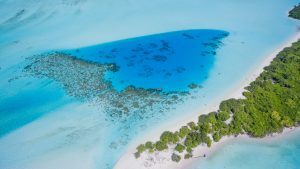 There are no direct flights from the United States to the Maldives, so you will have to make a connection anyway. Because of how many people honeymoon in the Maldives, first and business class seats tend to get booked up fast, particularly on the most popular routes. As for finding accommodation deals, it’s a good idea to sign up to resort’s newsletters and to follow their social media platforms. They will give you a heads up when they are offering flash sales, special discounts and so on. 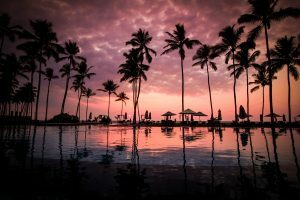 If you’re traveling to the Maldives on a budget, then this article will help you to find the best Maldives hotel deals around. Some of our favourite places to stay including the breathtakingly beautiful Centura Grand Resort – click here to check out their stunning overwater villas. As well as the beautiful Constance Moofushi which has one of the best infinity pools in the Maldives. Airbnb options are springing up on the local islands, and they provide an affordable way to stay in the country without shelling out for a pricey resort. You can also try searching for local guesthouses, B&Bs and other Maldives accommodation. Or, if you’re a keen scuba diver, snorkeler or even surfer, a liveaboard boat option may be good for you. Liveaboard holidays will often include all of your meals as well as water-based excursions. To shave some extra cash off your Maldives flights and hotels, try redeeming your air miles for discounts or upgrades. You can also use Cashback sites to get a percentage discount off your bookings. 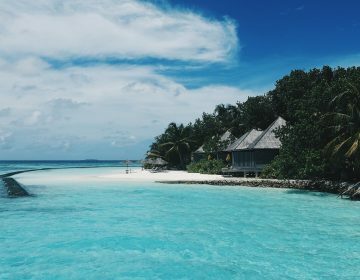 Overall, we recommend Maldives package holidays to anyone who wants to save a whole lot of time and hassle when it comes to booking their vacation. As everything is bundled together, it really does simplify the whole booking process. However, if you are blessed with flexibility, or even enjoy the hunt of finding the best deals, flights, and resorts, then you may want to go down the route of booking your Maldives hotel separately. Whatever you choose, a Maldives getaway is sure to be one that you’ll remember for years to come. Happy travels.